Ria Blaas first came to Vermont from her native Netherlands "on a whim," she said. That was 1981, a year after she completed training in sculpture at the Royal Academy of Fine Arts in Amsterdam. With the exception of about three years in the mid-'80s, she has been here since, making her home in the woods of Sharon. Her formal education reveals itself in her exquisite sculpture, despite a professed disdain for sophistication — which also shows up in her work, in woundlike gashes that mar otherwise smooth forms. Most of Blaas' works are made of wood, and they vary greatly in scale. Her thick figurative sculptures of expertly shaped human forms bear exaggeratedly — even defiantly — rough surfaces. While Blaas has employed different approaches to art making over the years, her output remains distinct and significant. Yet opportunities to see her work are few and far between. Three of her sculptures were included in the Fleming Museum's "In Grain: Contemporary Work in Wood" exhibition last year. Blaas showed at Burlington's Flynndog gallery in 2014, and she participated in Helen Day Art Center's 2011 "Exposed" outdoor sculpture showcase. A handful of her pieces are currently on view at Scavenger Gallery in White River Junction. There is just one place, however, to see examples of Blaas' larger sculptures year-round: the Path of Life Sculpture Garden in Windsor. 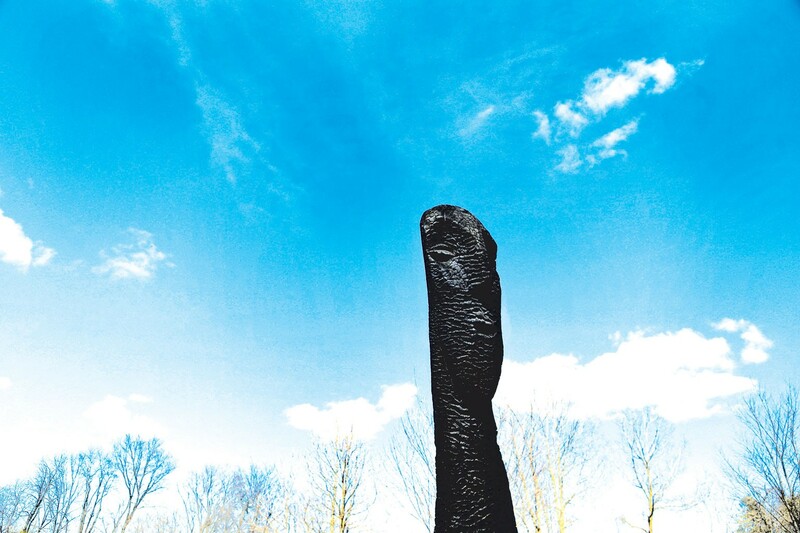 This 14-acre attraction is located just off Interstate 91 in a field along the Connecticut River. The sculpture garden is the creation of Norwich therapist Terry McDonnell, who began work on it in 1997. For a nominal fee paid at the entrance, visitors can walk through the so-called "Tunnel of Oblivion" — essentially a culvert passageway — to view 19 landscaped vignettes that illustrate "elements that constitute human life," according to the venue's website. Among pieces with labels such as "Birth," "Adventure," "Creativity," "Hope," "Ambition" and "Forgiveness," Blaas' 12 figures stand arranged in a circle; they are meant to symbolize community. McDonnell commissioned Blaas at make the group of wooden, charcoal-surfaced heads in 2004. "I've always made faces," said Blaas during a recent visit to her Sharon studio. "[Faces are] what we communicate with ... what we can be fooled with, cheated with, addicted to." For her Path of Life heads, she channeled this sensitivity to the face's power into massive, 7-to-12-foot-tall pine logs. They have expressions that seem alive, from that of a laughing youngster to that of a wizened elder whose crinkled eyes and closed lips are harder to parse. Blaas' accomplishment of such nuance on such a large scale is impressive. She estimates that each sculpture weighs between one and two tons. She creates her sculptures with a tool that many Vermonters know well: the chainsaw. "A chainsaw to me is almost like ink and pencil," Blaas said. She explained that the subtractive process is akin to "finding" the sculpture within the wood: "I've always been a little excavator." After carving the pieces, Blaas said, she burns them over a fire pit outside her studio until their outer layer turns to charcoal. Intense heat is applied to the wood as it's held over a slow-burning fire. The labor-intensive process produces an effect that couldn't be achieved with "just a torch," Blaas said. The charcoaling "gives this amazing texture that's like skin." The play of wood, fire and water is central to Blaas' work, as is the metaphorical parallel of wood and the body. "Wood is like human flesh," she said. "It has water in it; it's alive. When it's dead, [it] turns gray, just like bones." 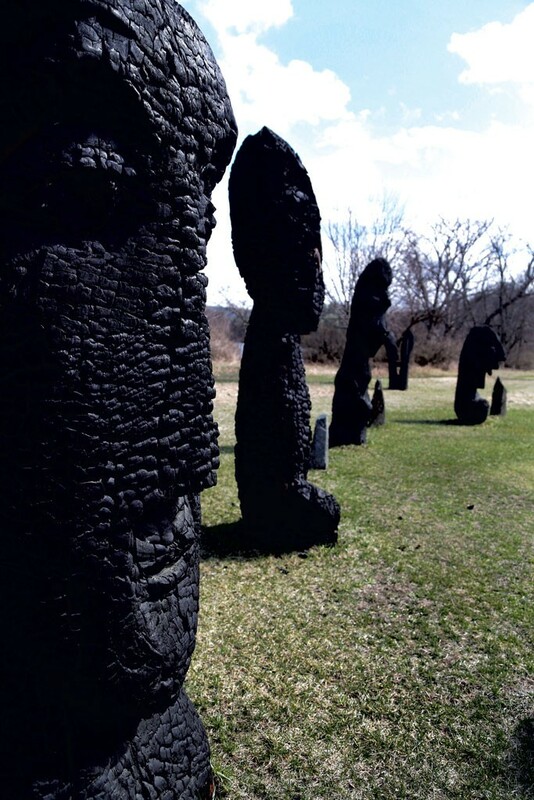 Another series of Blaas' charcoaled works, called the "Incurious Seekers," can be seen in front of Main Street Museum in White River Junction. These are logs that Blaas has shaped into heads and armless torsos on long legs, standing about 18 feet tall. The artist identifies "incurious" as "a [Samuel] Beckett word" that contrasts the outwardness of curiosity with the notion of looking inward. The Path of Life heads are similarly paradoxical. 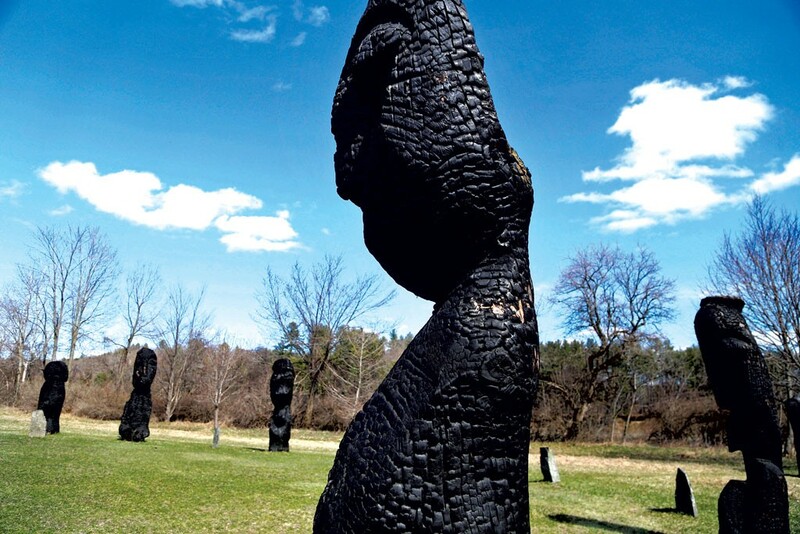 Despite their lively faces and movement, the sculptures are charred — a word often used as shorthand for obliteration. The charred remains, as it were. This element of ruin resonates with Blaas, who suggested that it is "the fascination of our time." "We love ruins," she said, "as long as it's not our ruins." Yet charcoaling can also bear the opposite connotation: Blaas pointed out that it was once used as a means of preserving fence posts to keep them from rotting. The deep black of Blaas' charcoal also brings to mind the recent scientific discovery of the "world's darkest material," Vantablack, made of carbon nanotubes. (Exclusive rights to its use for art making have been given to artist Anish Kapoor.) Blaas' Path of Life heads smuggle the language of death and darkness into their representation of community — typically a warm-and-fuzzy concept, particularly when used in marketing. Smaller variations of the artist's "Incurious Seekers" can be found in the sculpture garden's "Death plot," standing amid severed trees. More generally, the Path of Life Garden's espousal of the cycle of birth, death and rebirth seems to resonate in Blaas' world, as well. At her studio, a blue-painted wooden head sat beside the woodstove, waiting to fuel the fire. The head's body was at the other end of the room, being transformed into something else. Blaas acknowledged that she was "redoing old sculptures," and referenced Nietzsche's claim that destruction is an important part of creativity. In the case of her sculptures, it certainly is. The original print version of this article was headlined "The Art of Ruin"